It is the third largest city in Nebraska… most days that is. On a select few Saturdays, and one notable Friday each autumn Bellevue slips to 4th, surrendering its bronze medal to Memorial Stadium. It is the home of Husker Football; an ancient relic of a stadium that is routinely filled with 91,000 crimson-clad lunatics. Routinely may be an understatement… try always. Every single game sold out since 1962. A true blueblood of college football, Nebraska football is unique. Expectations among the legions of fans are sick. For most teams an eight win season gets their coach a contract extension, in Lincoln it gets you fired. 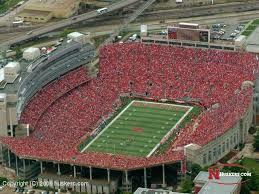 Friday I found myself in the belly of this beast; a lone Hawkeye fan sitting among Big Red season ticket holders. And as my Hawkeyes laid a monumental beatdown on the local squad (38-17) a funny thing happened. I saw Big Red’s true colors, and they were spectacular. Late in the 4th quarter the crazy, sick, irrational and devoted fans seated around me did a really odd thing. They began to congratulate me. They each took turns shaking my hand and genuinely wishing me well. It was bizarre. Five minutes from collecting their 4th loss of the year (three seasons worth) they bore no anger, no bitterness, no excuses– just grace. One guy even offered (unsolicited) to take my wife and my picture with the scoreboard in the background. And the whole thing was genuine. I thought I was in the Twilight Zone. Turns out the same school that tolerates the single most immature coach in all of college football has fans that make Tony Dungy seem like a jerk. I gotta say, in some small way it kinda makes me a Nebraska fan. Second to the Hawks of course, but I like good things to happen to good people, and these are good people. What they have, their dedication and love of the Huskers is really special. As Evangelists we can learn a lot from this. Telling people about God is great, but if we leave all the positivity at church on Sunday, we are missing the boat. Are you sure you weren’t seated in the family section? This article echos one of my favorite Bible verses, one of a very small few that I have taken the time to memorize, to serve as a constant reminder that we should attempt to be like the light of Christ (or aroma, for that matter). I am glad you wrote about this expereince. I have been telling Iowa fans for along time that has been my experience as an ISU fan with Nebraska fans in Ames and Lincolon. Some of the very best fans and people in the nation! Sure, all teams have their few jihadic, inapropriate jerk fans. But from my experience the Neb faithful really are some of the best hosts I have ever been to! GREAT PEOPLE! In contrast, about 10 yrs ago I went to an ISU game @ Dekalb, IL (Northern Illinois) and I was walking up to their glorified Valley high school stadium (literally) holding my 2 yr old daughter getting yelled obscenities at and cursed at and pelted by beer cans. It was truly disgusting. It was a small mac athletic school, that had BCS envy and did not know how to act. It was awful, and I would never go back there. I visited the Big House for a Minnesota vs. Michigan game in 2007, a month after Michigan infamously lost at home against Appalachian State. I decided to purchase a brand new Appalachian State t-shirt to wear to the game, trying to bring a little underdog luck to the overwhelmed Gophers. The Michigan fans accepted the shirt with great humor, lots of comments and laughs. Well worth the $20 investment (+ shipping).